Qorvo is powering the systems all around you. Your home. Your smartphone. Your car. Even outer space. All around you, Qorvo products are at work providing industry-leading solutions to answer your RF challenges. We bring core technologies and radio frequency (RF) solutions to mobile devices, infrastructure, defense/aerospace and Internet of Things. Innovations such as GaAs, GaN, SAW, BAW as well as integrated assembly, custom die-level packaging and expert engineering, Qorvo is developing solutions to meet the world's mission-critical needs and solving RF challenges for our customers. Latest solutions for 5G and Massive MIMO, from sub-6 GHz to millimeter wave. Industry leading GaN-on-Sic for defense applications. RF solutions for IoT, automotive and high-performance home Wi-Fi. 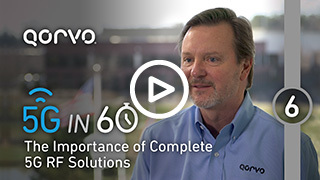 The Importance of Complete 5G RF Solutions - An interview with Qorvo's President of Mobile Products, Eric Creviston. Click on the icons to explore the Qorvo solutions for solving your toughest challenges. 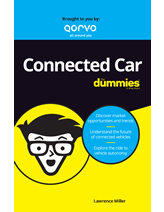 Visit our E-Books page in our Design Hub for all the For Dummies® titles available from Qorvo. 5G is more than low-band front-end modules and switches. At Qorvo, we have all the core RF technologies to fully address and enable 5G — from wireless infrastructure to mobile devices to the technologies to make them happen. And we partner with carriers and standards bodies to bring the vision to life.